Today is celebrated in Russia as the Victory of the Novgorod Republic over the Teutonic Knights in the Battle of the Ice (Ледовое побоище), fought on 5th April 1242, largely on the frozen Lake Peipus. I don’t often commemorate battles on this blog, but I am making an exception here because this battle illuminates a part of European history that tends to get underplayed, or plain ignored, in modern consciousness, namely the general understanding of what the so-called Crusades were all about. The popular image of the Crusades, very poorly understood, is of Western Christian armies fighting Muslims in the Near East for control of Jerusalem and the Holy Land, ostensibly to allow access by Christian pilgrims. This piece of the puzzle is only a very small part of the whole story. In a nutshell, with me being hopelessly simplistic as usual, the Crusades were an attempt by Western European powers to control Eastern Europe as well as the Near East using religion as their justification. In my cynical opinion the real motive was power and wealth. For me the only important question in history is WHY? The answer is always the same – MONEY. Although the Crusades are usually characterized in the Western mind as wars between Christians and Muslims, they were as much, if not more, wars between Catholic and Eastern Orthodox territories, as well as between Catholic forces and inhabitants of regions that are now, rather misleadingly, called “pagan” where pagan means not Jewish, not Christian, and not Muslim. There was no pagan religion as such. The word is a catchall for numerous diverse religions outside those that are sometimes called the Religions of Abraham (because he is ancestral to all three) or Religions of the Book (i.e. the Torah which is common (sort of) to all three), that is, Judaism, Christianity, and Islam. The First Crusade arose after a call to arms in a 1095 sermon by Pope Urban II. Urban urged military support for the Byzantine Empire and its Emperor, Alexios I, who needed reinforcements for his conflict with westward migrating Turks who were colonizing Anatolia. One of Urban’s stated aims was to guarantee pilgrims access to the holy sites in the Eastern Mediterranean that were under Muslim control. Urban’s wider strategy may have been to unite the Eastern and Western branches of Christendom, which had been divided since their split in the East–West Schism of 1054, and establish himself as head of the unified Church. The response to Urban’s preaching by people of many different classes across Western Europe established the precedent for later Crusades, which, among other things, provided opportunities for economic and political gain. The Crusaders’ behavior, under Papal sanction, was often deplorable. For example, Crusaders frequently pillaged as they travelled, while their leaders retained control of much captured territory rather than returning it to the Byzantines. During the People’s Crusade (1096) thousands of Jews were murdered in what is now called the Rhineland massacres. 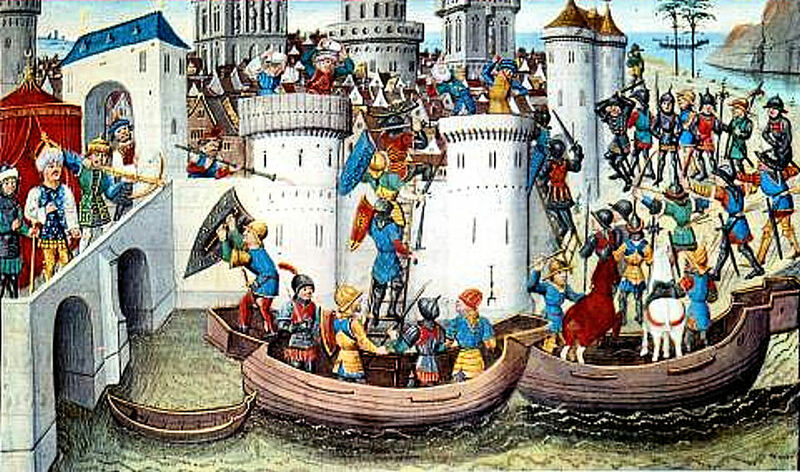 Constantinople was sacked during the Fourth Crusade (1202-04) rendering the reunification of Christendom impossible. Subsequently the Crusades actively attempted to capture regions that were under Eastern Orthodox control. The Battle on the Ice was part of this larger enterprise sometimes called the Northern Crusades. The Northern Crusades or Baltic Crusades were religious wars primarily undertaken by Christian military orders and kingdoms against the Baltic, Finnic, and Slavic peoples around the southern and eastern shores of the Baltic Sea. The crusades took place mostly in the 12th and 13th centuries and resulted in the subjugation and forced baptism of indigenous peoples. 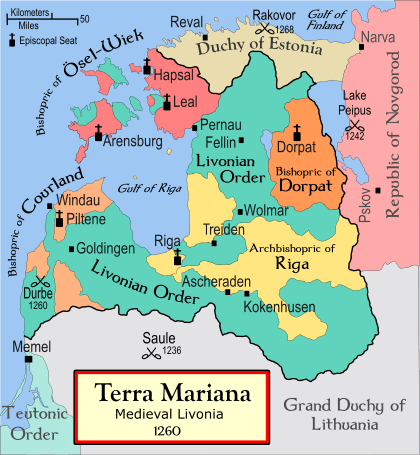 The Teutonic Order’s attempts to conquer Orthodox Russia (particularly the Republics of Pskov and Novgorod), an enterprise endorsed by Pope Gregory IX, marked the tail end of the Northern Crusades. The Battle of the Ice in 1242 is usually considered to be the key turning point, although historians do not all agree concerning its importance. Hoping to exploit Novgorod’s weakness in the wake of the Mongol and Swedish invasions, the Teutonic Knights attacked the neighboring Novgorod Republic and occupied Pskov, Izborsk, and Koporye in autumn 1240. When they approached Novgorod itself, the local citizens recalled 20-year-old Prince Alexander Nevsky to the city, whom they had banished to Pereslavl earlier that year. During the campaign of 1241, Alexander managed to retake Pskov and Koporye from the Crusaders. In the spring of 1242, the Teutonic Knights defeated a detachment of Novgorodians about 20 km south of the fortress of Dorpat (Tartu). Led by Prince-Bishop Hermann of Dorpat, the knights and their auxiliary troops of local Ugaunian Estonians then met with Alexander’s forces by the narrow strait (Lake Lämmijärv or Teploe) that connects the north and south parts of Lake Peipus (Lake Peipus proper with Lake Pskovskoe). On April 5, 1242. Alexander, intending to fight in a place of his own choosing, retreated in an attempt to draw the over-confident Crusaders on to the frozen lake. The crusader forces likely numbered around 2,600, including 800 Danish and German knights, 100 Teutonic knights, 300 Danes, 400 Germans and 1,000 Estonian infantry. 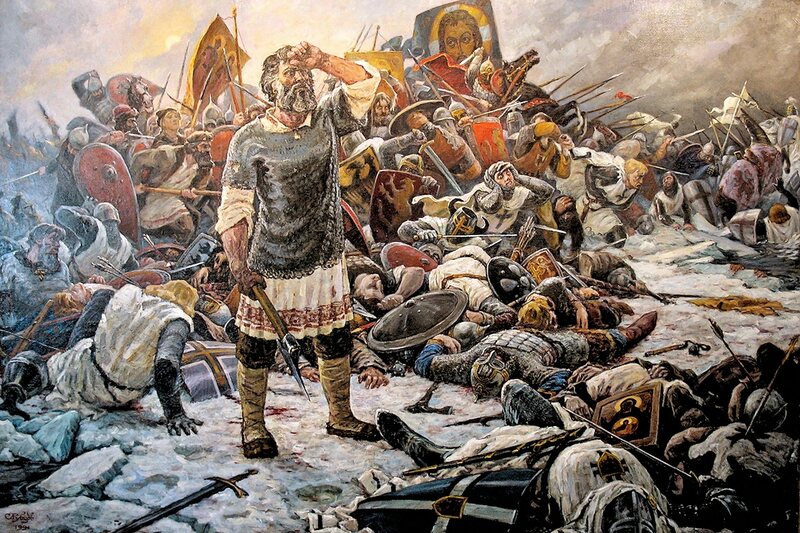 The Russians fielded around 5,000 men: Alexander and his brother Andrei’s bodyguards (druzhina), totaling around 1,000, plus 2000 militia of Novgorod, 1400 Finno-Ugrian tribesman and 600 horse archers. The Teutonic knights and crusaders charged across the lake and reached the enemy, but were held up by the infantry of the Novgorod militia. This caused the momentum of the crusader attack to slow. The battle was fierce, with the allied Russians fighting the Teutonic and crusader troops on the frozen surface of the lake. After a little more than two hours of close quarters fighting, Alexander ordered the left and right wings of his army (including cavalry) to enter the battle. The Teutonic and crusader troops by that time were exhausted from the constant struggle on the slippery surface of the frozen lake. The Crusaders started to retreat in disarray deeper onto the ice, and the appearance of the fresh Novgorod cavalry made them retreat in panic. It is commonly said that “the Teutonic knights and crusaders attempted to rally and regroup at the far side of the lake, however, the thin ice began to give way and cracked under the weight of their heavy armor, and many knights and crusaders drowned”; but Donald Ostrowski in Alexander Nevskii’s “Battle on the Ice”: The Creation of a Legend contends that the part about the ice breaking and people drowning was a relatively recent embellishment to the original historical story. He cites a large number of scholars who have written about the battle, none of whom mention the ice breaking up or anyone drowning when discussing the battle on the ice. After analyzing all the sources Ostrowski concludes that the part about ice breaking and drowning appeared first in the 1938 film Alexander Nevsky by Sergei Eisenstein. 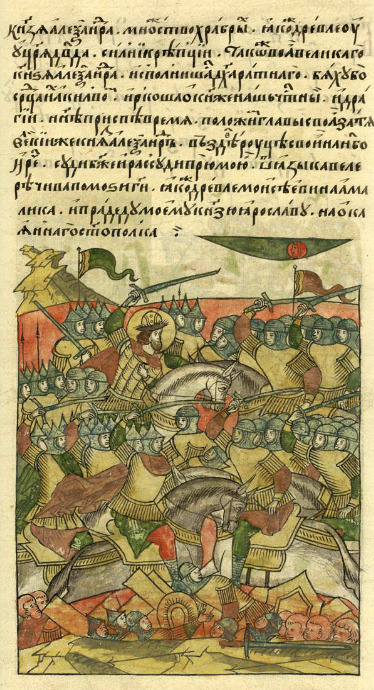 The day is particularly celebrated in Russia because it is commonly held, although disputed by historians, that the victory of Novgorod at the Battle on the Ice stopped further incursions into Russia by Crusaders. There’s not much source material on uniquely Novgorod cooking of the Middle Ages. They ate cereals, such as oats, rye, wheat and barley as both bread and porridge primarily, with the addition of vegetables and meat on occasion, just as did all Slavs at the time. The common Russian word “kasha” which refers to buckwheat in the West, is just a general term for porridge in Russia, made from any cereal including rice. I have already given a basic recipe for buckwheat kasha here – http://www.bookofdaystales.com/yuris-night/ Let’s try something a bit heartier. 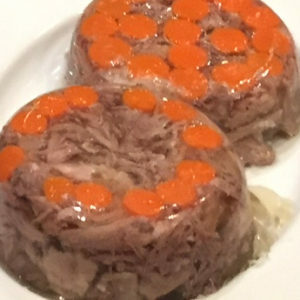 I suggest kholodets, a common Slavic cold dish of shredded meat in gelatin made by boiling down meaty bones. I figured a cold dish was suitable to commemorate a battle that took place on ice. You can choose what meats you want, including pork, veal, beef, or chicken. A mixture is common. I like beef and veal. You’ll need to start with 2 pounds of beef bones and a mix of stewing beef and veal. Place them in a large stock pot with a scrubbed, unpeeled onion, cover with cold water, bring to a simmer, and cook, covered, for at least 5 hours, skimming the scum from the pot as necessary. Remove the bones and onion from the broth, add what vegetables you would like as a garnish – one or two peeled carrots will do – plus seasonings that you prefer, such as garlic, salt and pepper. Bring back to a simmer and cook for another 45 minutes. Remove the meat and vegetables, and strain the broth through fine muslin into a clean bowl. Shred the meat into small pieces and slice the vegetables. You can use one big mould or several smaller ones for the finished dish. Lightly grease the moulds then lay some vegetable pieces at the bottom. Then add the shredded meat and fill up the moulds with the strained broth. Refrigerate overnight. In the morning the broth will have set up as a gelatin with some fat on top. Scrape off the fat, dip the moulds in hot water for a minute to release the jellied meat, place an inverted plate over each mould, turn it right side up and tap gently to release. If you have created enough gelatin from the bones they will come out clean. Of course you can always cheat and add a little extra packaged gelatin during the final simmering to be on the safe side. I usually do. The onion skin will give the broth a brownish tinge. Some people use sliced boiled eggs rather than vegetables as the garnish. Your choice.